One of your core responsibilities as a boss is to build a cohesive team. Radical Candor can guide you. Challenge everyone to do exceptional work and show you Care Personally by ensuring that people’s roles are aligned with their skills, interests, goals, and dreams. Focus on the people who are doing exceptional work. Some will be in a steep growth phase (don’t clip their wings), others on a gradual growth phase (don’t undervalue them). The majority of people on your team are probably performing at an “average” level. Give them opportunities to improve — and, if they don’t improve, have some hard conversations. Some people will fail to perform. Sometimes it is your fault — you’ve put them in the wrong role, not clarified expectations etc. Other times, the job is just not right for the person, and it’s time to part ways. Have Career Conversations with the people on your team — get to know their life stories, understand what motivates them and what their dreams are, and help them take tangible steps towards achieving what they want out of life and work. Be a Thought Partner — Help your team perform at their best by enabling their progress. Avoid becoming either micro-manager or an absentee manager. Take time for Growth Management — Assess what you need to do to push each of your team members towards achieving excellence. 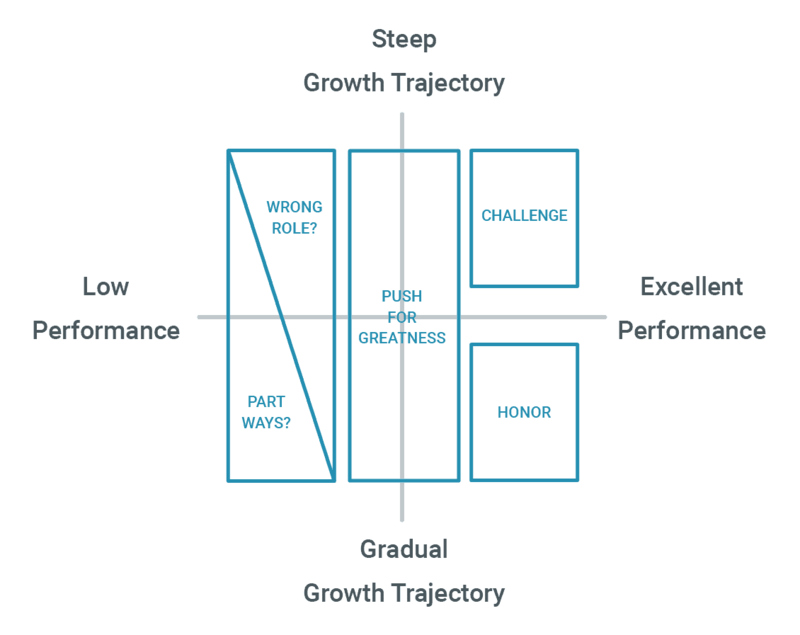 Give fair ratings based on performance, not based on growth trajectory. Learn more about building a team in the advice columns and articles on our blog.